Take a unique guided tour through North Carolina’s largest city on a guided tour of Charlotte and see some of the top attractions in the area. From its earliest years to the present, Charlotte has had many nicknames but we simply call it 'home'. We are proud of where we live and have a strong desire to share the historical side of this city! We can't wait to pass along this information to first-time visitors as well as long-time residents. 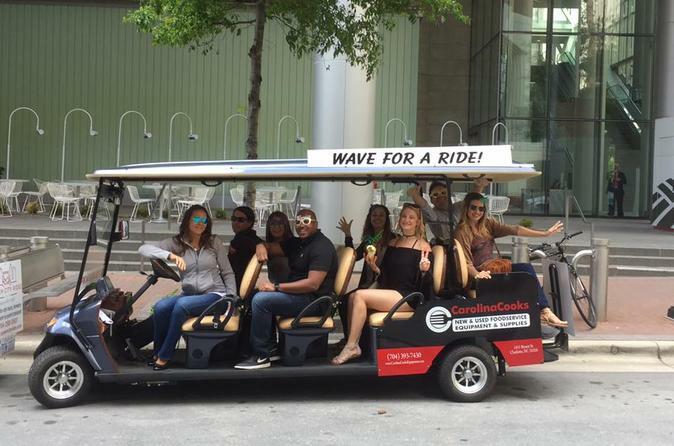 Sit back and enjoy a smooth tour on one of our golf carts. Explore the city of Charlotte on one of our unique golf carts and see some of the most popular landmarks and neighborhoods Charlotte has to offer. We will depart from Fitzgerald’s, located in the heart of Uptown Charlotte, on one of our 7 person golf carts. We will then venture off on an exciting, fully narrated experience through the Queen City. Throughout this guided tour you will see top attractions such as the beautiful 390,000 square foot NASCAR Hall of Fame where all the top drivers, crews and owners are now immortalized. You will see many of the museums Charlotte has to offer such as Discovery Place, The Mint Museum, Imaginon and Levine Museum of the New South. You will also get to see where our sports teams play! We will ride by Bank of America Stadium, home of the Carolina Panthers, Spectrum Center, home of the Charlotte Hornets as well as many concerts and shows, and BB&T Ballpark, home of the Charlotte Knights. We want to show our guests some of Charlotte's oldest neighborhoods, as well as various up and coming neighborhoods. You will see the beautiful homes of Historic 4th Ward that sits in the heart of Uptown. We will drive through First Ward, a neighborhood that originally provided housing to laborers in the industrial era, and is now home to the University of North Carolina at Charlotte Center City Campus and First Ward Park. We will then cruise to South End, which is home to the arts district as well as many of Charlotte's breweries. NoDA and Plaza Midwood are known as Charlotte's most diverse and eclectic neighborhoods, which are filled with art galleries, funky stores, and restaurants. There is so much to see in Charlotte and we are looking forward to sharing our city with you! There are plenty of opportunities to stop and take photos on the tour.